Since installing a 0.5MW electrolyser on our Caldale site on Eday in 2016, EMEC has been actively involved in projects which test and demonstrate new hydrogen technologies. 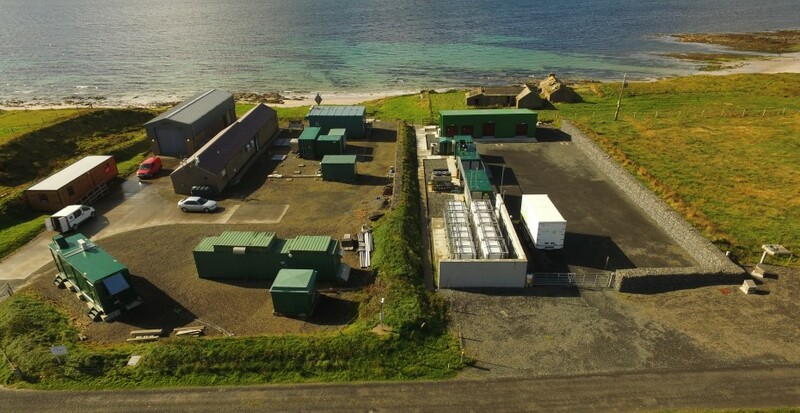 Through continued commitment from local stakeholders to incorporate hydrogen into the local energy system, Orkney has become a leading example of a developing hydrogen economy. Surf ‘n’ Turf was the first community project in Orkney to harness wind and tidal power for hydrogen production. The project received £1.3 million of Scottish Government funding through the Local Energy Challenge Fund and in August 2017 the world’s first tidal-powered hydrogen was generated on EMEC’s tidal test site as part of the project. The hydrogen produced by EMEC’s electrolyser on Eday is stored; transferred to specially designed hydrogen storage trailers; and then shipped to Kirkwall, where a 75 kW fuel cell (housed at Kirkwall Pier) converts hydrogen back to electricity, which is used as auxiliary power for the ferries when docked in the harbour (a process known as ‘cold ironing’). Through Surf ‘n’ Turf, accredited hydrogen training courses are offered in conjunction with the local college, increasing local job opportunities. For more information visit the Surf ‘n’ Turf project website. 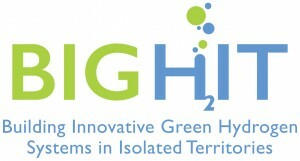 Funded by the Fuel Cells and Hydrogen Joint Undertaking (FCH-JU) under the EU Horizon 2020 programme, BIGHIT (Building Innovative Green Hydrogen Systems in an Isolated Territory: a pilot for Europe) builds on the Surf ‘n’ Turf project by incorporating energy from Shapinsay’s community wind turbine to produce hydrogen which is then shipped to Kirkwall in specially designed storage trailers. BIGHIT has enabled the construction of a hydrogen refuelling station in Kirkwall which powers a fleet of five electric council vans (each fitted with a hydrogen fuel cell range extender). Additionally, two hydrogen-powered boilers will be installed at suitable premises to provide zero carbon heat. For more, visit the BIGHIT website. An Innovate UK funded project, Powering Isolated Territories with Hydrogen Energy (PITCHES) will demonstrate the feasibility of using hydrogen to meet the energy needs of remote communities, such as Malawi. This project builds on the experience gained in the BIGHIT project. PITCHES will deploy and demonstrate an integrated hydrogen solution, including renewably-powered production, delivery and use of hydrogen, in the Orkney Islands. Through the demonstration, the project will explore the replicability of such systems to isolated, off-grid communities, including in Sub Saharan Africa, by testing configurations of the system, and identifying business models which best suit off-grid communities in developing countries. The Integrating Tidal Energy into the European Grid (ITEG) project, awarded €11 million of funding by the Interreg North-West Europe programme, addresses the issue of grid constraints in remote areas through the use of an ‘all-in-one’ hydrogen production solution, integrating tidal energy with hydrogen production. Using excess power generated by Orbital Marine Power’s 2MW tidal turbine the Orbital O2 2MW (due to be deployed in 2020), the project will see an additional 0.5MW electrolyser built by AREVAH2GEN and a smart onshore energy management system (EMS) installed on Eday which will enable EMEC to determine whether the tidal power generated at the EMEC’s Fall of Warness test site is fed into the grid or into the electrolyser to produce hydrogen. For more, visit the ITEG project website. Innovate UK have awarded £430,332 of funding to the Hydrogen & Diesel Injection in a Marine Environment (HyDIME) project. HyDIME will see the design and integration of a hydrogen/diesel dual fuel conversion system on a commercial ferry operating between Kirkwall and Shapinsay. The project will use the hydrogen produced by EMEC on the ferry which will power the auxiliary systems of the vessel. The project will also gain the necessary marine licences and regulatory approvals for hydrogen to be used as a fuel in a marine environment which will have a significant impact on future hydrogen marine projects across the rest of the UK.